Every designer has this vision – to get their designs right the first time while meeting targets for function, quality, and cost. 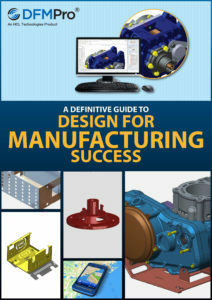 The discipline of Design for Manufacturing (DFM) intends to aid designers in doing just that. By expanding the use of DFM across all design disciplines, implementing it both upstream and downstream in the process can help find design issues early in the cycle and reduce designer’s rework and improve his productivity. To get these guidelines in your inbox subscribe to our DFM Guidebook now!